Okay, this post is a perfect example of how far behind I've been lately. I wanted to put this up last October. I had the pictures ready to go, but I didn't have the time or the opportunity to post this until now. In my own defense, I did publish several titles in the last few months and this blog is sort of secondary to my real job of writing books. Plus, I spent a lot of my blogging space letting you all know about my new books, because that's kinda how it works. 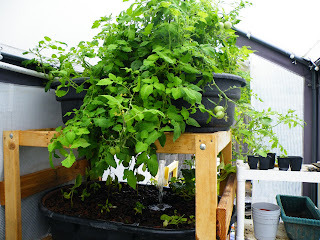 Anyway, I've blogged in the past about my interest in aquaponics (a great introduction to the concept of aquaponics at this link, and some good links as well). 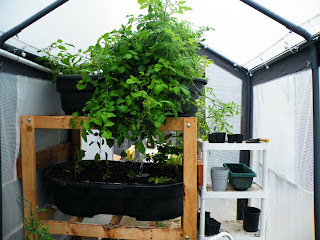 Last spring, I introduced my own personal experiment in aquaponics. As you'll see in the images below, I purchased two stock tanks for the grow beds and filled them with lava rock. My reasoning behind this was that lava is both lighter and far less expensive than the more popular expanding clay pebbles. Throughout the year, I came to understand the reasons for this. The lava rocks worked, and I'm certain they were lighter than river stones and probably even clay, but they have very rough edges. This made it difficult to work with, and some of the plants weren't too happy. Our cabbage and lettuce never really took off, which was especially disappointing in the case of the lettuce. This is supposed to be the perfect environment for lettuce. From what I've read, lettuce thrives in hydroponic and aquaponic situations. Further aggravating the problem was the fact that my tomatoes went nuts. We had purchased several small plants of different organic varieties, and grew a few more from seed. We soon learned that we had gone overboard with the tomatoes. They filled their grow tank, burst over the sides, and even tangled themselves up along the roof of the greenhouse. The result was that the lower bed received very little light and the other plants were struggling. The basil survived, but disappointed. The zucchini took off for a while and produced a decent amount of edible produce, but eventually died off. 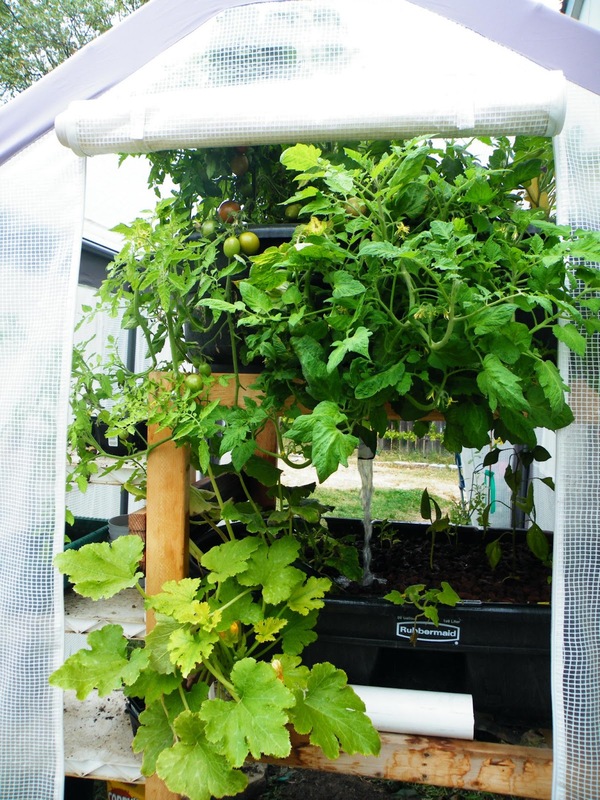 All of the plants seemed inclined towards fungus or mildew problems due to the wet environment, especially after the weather began to cool. During the warmer months, we were able to leave the doors and windows of our small greenhouse open and this helped to combat the humidity. By October, we had to keep it closed up for fear of frost. And quite honestly, I forgot to open it up during the day a few times, and also to close it back up at night. In case you're wondering, the fish are located in a separate, much larger stock tank located under my patio where the water stays cool and protected. I used a 350 gallon stock tank and, after cycling it for a few weeks to get it ready for fish, purchased two small koi fish. I wanted the koi because of their hardiness, and to get the system cycling correctly on its own. By the end of summer, I still hadn't added any trout, but the koi had grown from about an inch to seven or eight. After what I've learned from my first year, I think I'll pull out most of the lava rock and replace it with something more forgiving.I still plan on adding some trout, but I'll probably scale the system back a bit. The 350 gallon tank should be capable of supporting about 75 full grown fish, but I never planned to go that far. I will probably start with 15-20 fingerlings and see how things progress. From the beginning, it has been one of my highest priorities to take precautions for the well-being of the fish. Yes, I do plan on eating some trout, but until then I want them to be healthy and happy. I may also reconfigure things to better use what sunlight I get in the backyard. In the past, we have had trouble with vegetables planted alongside the house getting scorched from all the sun. Now, suddenly it seems our backyard hardly gets any sunlight. Ah, the joys of being a farmer. Kind of. If any of this is interesting to you, please check those links. Especially the first one, which will explain exactly how aquaponics works and where you can find more information. And if you're wondering why all of this, take a moment to consider how important our food supply is. What we put in our bodies can greatly affect our health (same goes for our families and friends). If that's not enough motivation for you, take a look at the price of food lately. A system like this is practically self-supporting and once its running, can provide a source of high nutrient, organic vegetables and protein at almost zero cost. Not to mention that this is the sort of thing you can do at home, not only in your backyard, but on a patio, deck, or in a window with good sun exposure. That's it for now. Thanks for stopping by.... Oh, and one more thing. You can check out my books here. Nothing on aquaponics, but plenty of good old sci-fi and fantasy. Remember: support your local authors and bookstores! It seems like I've been getting further and further behind on things this year. I know, I know. It's only January! I've already come up with several projects around the house I'd like to work on, plus another five or six books I'd love to write but probably won't have time to. But on the bright side I am writing, and also working on the cover concept for book three of the Shadow Born trilogy. This one will be exciting! I've also been toying with a post-apocalyptic manuscript in my spare time, which is a genre that's always fascinated me but I've never attempted to write. I'm only working on it here and there when the mood strikes and I have the opportunity. I don't know how it will end. I'm not even sure if I'll ever finish it, but I am enjoying the writing process. Perhaps it would be best to publish this piece as a serial? Any thoughts? I'll have to let that idea ferment for a while. In the meanwhile, I have been considering putting all three of the Tinkerer's Daughter titles together into one omnibus collection, and possibly marking the price down a few cents to make it a bargain. I've seen this a number of times with other Indie collections, so I suppose there must be something to it. After all, anything that makes my books available to a wider audience must be a good thing, and if some people prefer to have it all in one package, I'd like to make that possible. I'm not sure if or when that will happen, but at the moment it seems like a pretty good idea. At any rate, I suppose I should get around to the point of this post. As my regular followers know, I do giveaways fairly often. I make review copies and ARCs of my books available regularly, and occasionally I even give away something a bit more pricey, like a Kindle. A while back I promised that this was coming, and here it is. This week, I randomly chose one of my blog followers for this giveaway. The winner: Aobibliophile. Congratulations, Ao! I'll need you to contact me through my email address so I can get this thing in the mail. But before I do, I'll also make sure to download my entire collection for your reading pleasure. Enjoy, Ao! As for the rest of you, I wish I could give you each one, but I'm afraid that's a bit cost-prohibitive. I promise I will be doing more giveaways this year, so be sure to check in from time to time. That's it for now! I hope everyone had a joyful and rewarding holiday season. It looks like 2013 will be another interesting year, but hey at least we made it, right? 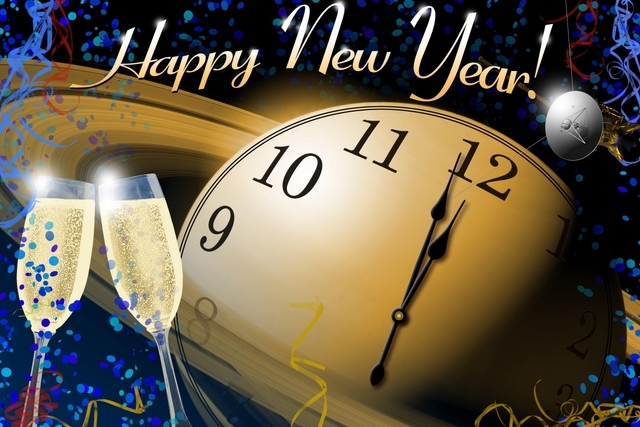 Hang onto your hats and get those resolutions in order! Personally, I'm not big on New Year's resolutions. I strive toward my goals and struggle with my failures every single day, so when New Year's Eve rolls around I'm thinking about champagne and fireworks, friends and family. I don't burden myself with the other stuff when I don't have to. Now that the celebrations have ended, the streamers have all blown away, and the fireworks have faded from the sky, it's time to get back to reality. Like most of you, I have big plans for this year. My goal is four novels. I've been hovering at three-four novels a year for the last three years and that's a comfortable pace for now. It can be a challenge of course, working around my family's schedules and other responsibilities, but I think I've got a system down. I've been able to manage fairly well. So what do I have on tap? Well, I've got a couple new series that I'd like to start, but don't dare until I finish the old business. Shadow Born, for example. Book Three is due and I would very much like to get it published. I've done some outlining, but as of yet haven't written anything. I also have two Hank Mossberg novels I'd like to write (and another written already that I may or may not publish eventually). And then there's this Tinkerer's Daughter series. Hmm. I suppose I have a few ideas there as well. More on all of that later. That's it for now. Thanks for stopping by, and a very special "Thank You" to all of those who have taken the time out of your busy lives to review and comment on my novels over the last year. You've made an impact in my life and I can't thank you enough.